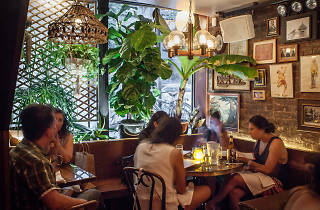 New Thai restaurant Uncle Boons is the latest in a riptide of upstarts repackaging homey Asian food—once relegated to holes-in-the-wall or fusty midtown warhorses—in buzzy, forward-thinking joints.This band of Far East boosters recently swelled with Bunker (Vietnamese), Jeepney (Filipino) and current It kid Mission Chinese Food, all preceded, of course, by first-wavers David Chang, with the Momofuku empire, and King Phojanakong at Kuma Inn. 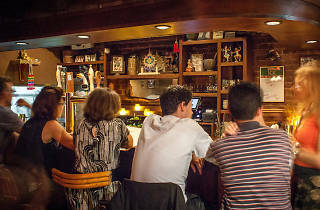 So at this dark-wood-paneled rathskeller, you’ll find tap wine and beer slushes, vintage Thai flatware carved from teak and brass, and perhaps a food-world luminary, like Eric Ripert on a recent night, plowing through noodles in the back dining room. The stereo blares old Thai covers of ’70s American pop and rock. A kitschy postcard pinned to the check sports the image of a toothy ladyboy. And the kitchen has fine-dining muscle: Husband-and-wife team Matt Danzer and Ann Redding met while cooking at Per Se. 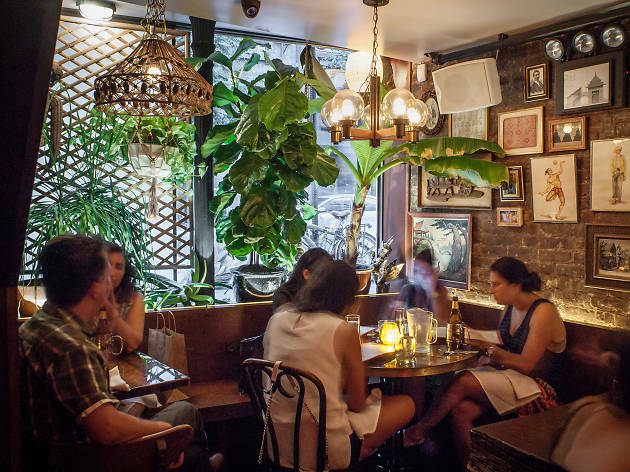 Uncle Boons’ closest brethren may be Andy Ricker’s bicoastal constellation of cultish Thai restaurants under the Pok Pok umbrella. But unlike Ricker, who hews closely to recipes as found in the motherland, Danzer and Redding (who is from Thailand) have unburdened themselves with a close reading of tradition. 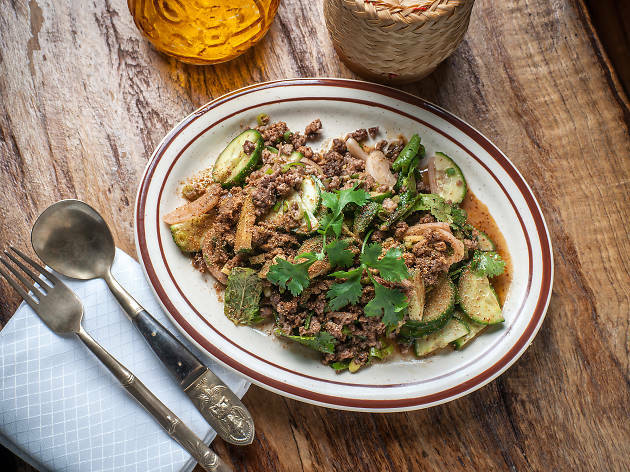 Take their rendition of larb(laab neuh gae), which instead of the usual chicken, duck, beef or pork, highlights a more chefly protein: lamb. You’re caught off guard when the trinity of that meat, cucumber and mint first hits you, flavors irrepressibly reminiscent of India or Greece. Then the bracing combination of fish sauce, lime juice and chili swerves you back to Thailand. Somehow, it works. 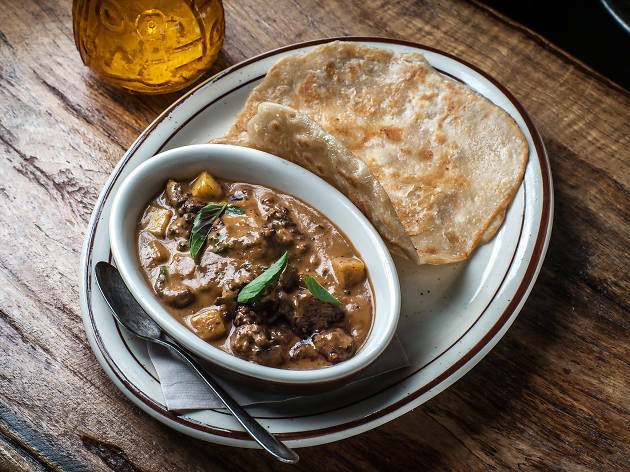 You may wonder if the idea of combining chicken livers and pineapple (dup kai kaeng supalot) is clever or misguided, but the gamey richness of the liver—chewy, yet not overcooked—is mellowed by a gently sour pineapple curry and cubes of the tropical fruit. 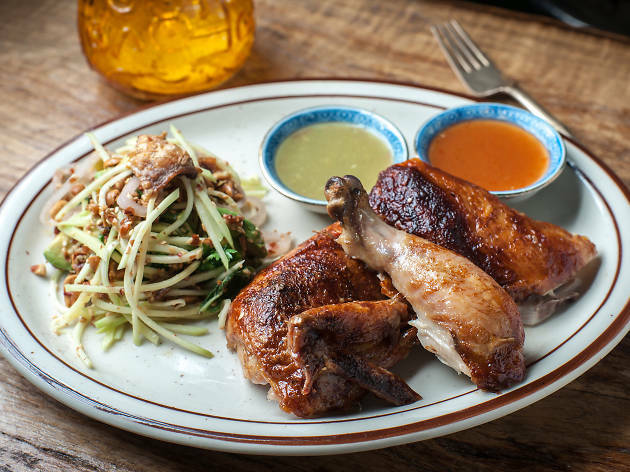 Those two dishes—listed among the “Thai drinking food” options (for now, drinking at Uncle Boons means no hard liquor)—are standouts, as is succulent roasted chicken (kai yang muay thai), from the rotisserie birds spinning near the bar. Simple snacks from the charcoal grill, such as head-on prawns and blowfish tails, are barbecued flawlessly, needing nothing more than a squeeze of charred lime. The sleeper pick of the entrée section is the scallop-and-red-curry custard (haw mok hoi), typically steamed in a banana leaf bowl, but here set in a round dish (and now made with rock shrimp instead of scallop). 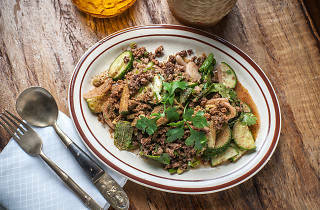 The spice is gentle, but raw Thai basil, kafir lime leaves and dehydrated ginger scattered on top amp up its vibrancy. There are times, though, when the chefs freewheeling approach goes off the rails. Fried sweetbreads with halfhearted creaminess and crunch distract from a tamarind-sour crispy noodle salad (mee krob) that’s more than good enough on its own. 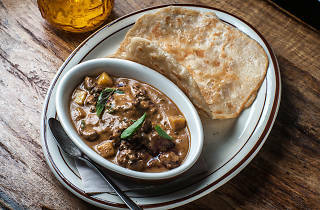 Potatoes in the massaman neuh—a beef curry from the country’s Muslim-influenced south—are not the usual tender, yielding cubes, but long, noodlelike strands, slightly too raw and unwieldy to ease into the rest of the dish. Slow-cooked and grilled pork spareribs err on the sweet side, the fried shrimp-paste rice underneath a bit muddied by soy. 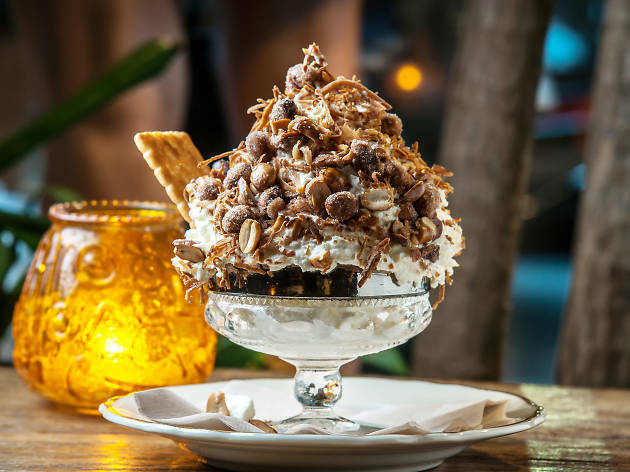 But Danzer and Redding don’t mess too much with other simple pleasures, like the lone dessert, a bowl of lush coconut ice cream. 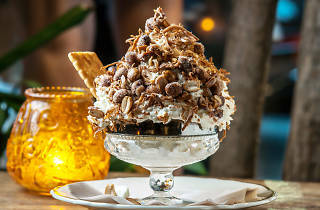 It gets a crunchy blanket of toasted coconut and peanuts, and a tweak of palm-sugar whipped cream—the best sundae I’ve had in some time. For the most part, in walking the line between commemoration and evolution, they've found the sweet spot. Vibe: With a thrumming bar scene and curated tchotchkes decorating the dark room, it’s happening enough for a night on the town, but the understated and gracious service also makes it suitable for a downtown date. Cocktail chatter: If you’re down with the vintage Thai pop playing during dinner, check out Sublime Frequencies, a record label unearthing obscure sounds from around the world. 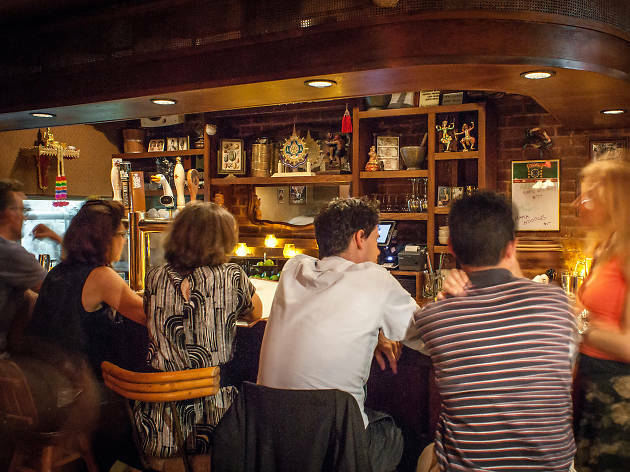 Soundcheck: There can be a racket at the bar, particularly when the bartender starts wrestling and rattling bottles for beer slushes, but a calm retreat can be found in the back room. bomb thai food. don't take reservations, so expect a wait. you can go to a nearby bar and they'll text you when its ready (our wait was 1.5 hours). rotisserie chicken salad was amazing. everything was so flavorful. One has to assume that the Venn diagram featuring "Michelin Star" and "beer slushie" can't have much overlap. Uncle Boons may be (as far as I know) the only exception. I've since had beer slushies elsewhere, but Uncle Boons was my first and definitely the best. Even if you're not a beer drinker, you can totally get down with these. Cool drinks didn't put this place among the likes of Per Se and Blanca though. The food is dynamite. Thai food has lost much of its allure after 50,000 new places opened up (in Hell's Kitchen alone). 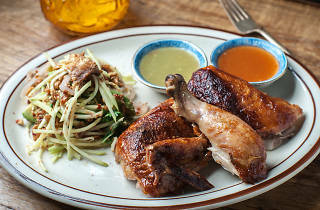 But Uncle Boons goes way beyond pad Thai and roots itself in more traditional dishes you won't find at every Thai place. The large plates are great for sharing, provided everyone has the same tolerance for spicy. Because, as a self-proclaimed spicy food wimp, that can get real uncomfortable real fast. Ask for a pitcher of water. ... or another beer slushie.